Product #21993 | SKU AH-QU-24 | 0.0 (no ratings yet) Thanks for your rating! The Qu-24 30-In/24-Out Digital Mixer from Allen & Heath features 24 of Allen & Heath's AnalogiQ microphone preamps and is powered by its 5 core ARM processor to provide a variety of integrated effects and processing including channel-independent 4-band parametric EQs, compressors, delay, reverb, and more. The mixer is capable of recording audio to either your Mac or a USB hard drive in up to 48kHz/24-bit resolution, allowing you to record both the individual tracks and live mix of your shows. 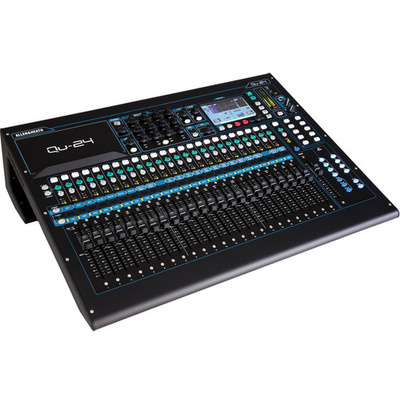 The mixer is compatible with both the ME monitoring system and dSNAKE digital connectivity system from Allen & Heath. The Qu-24 can also be used with the Qu-Pad app, allowing you to use your iPad to mix from anywhere in the venue when connected to a wireless network.